Dutch designer Nikki Giling attended the School of Fine Arts in Arnhem, the Netherlands, where she specialized in designing fashion accessories, graduating in 2008. During her study she followed a 1,5 year course for crafting leather bags. With this perfect combination of skills, design and craftsmanship come together in each design of Nikki Giling. In 2009 Giling started her own studio in Arnhem, working on accessory design and development, and several collaborations. Nikki Giling’s work is characterized by a minimalistic and functional style. She is always searching for new unexpected details that will make the product unique. With her eye for details and love for beautiful materials, as leather, rope, silk, cotton and wood, the accessories will be high quality and sustainable. Since 2010 Nikki Giling has her own accessory shop in Het Modekwartier (Fashion District), in Arnhem, were you can see and buy her fashion accessories. Every product is tailor-made specially for you! Wanna learn from the master? 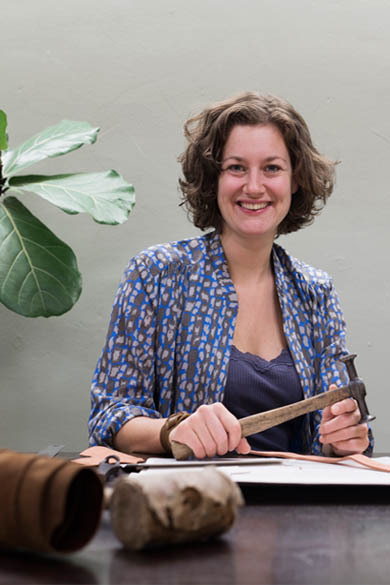 You can also follow one of her workshops to make your own leather bag!